To provide greater detail, medals are not shown actual size. Compare medal size with familiar coins. 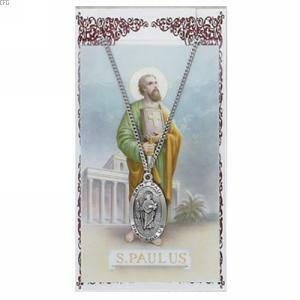 This oval St. Paul medal measures 1 2/16" long and is made of pewter. This medal comes on a 24 in. chain. Matching laminated St. Paul prayer card included. Patron Saint of Authors. Packaged in a deluxe felted metal hinged jewelry box (color may vary from picture). Made in the USA by McVan. Do You Want This Engraved? The custom engraving options are shown to below. Please note that your medal will be engraved exactly as you indicate. There are no returns on engraved medals. Your medal will be engraved exactly as you indicate. There are NO RETURNS on engraved medals.